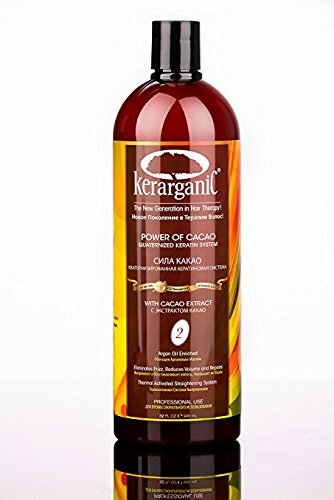 Kerarganic Keratin Power of Cacao Quaternized Keratin System 32 oz by KERARGANIC at Beauty Sols. MPN: B00G3JFRZ0. Hurry! Limited time offer. Offer valid only while supplies last. KERARGANIC�s advanced treatment and smoothing formulation to repair hair damages and to tame curls, to reduce volume and to control frizz. View More In Shampoo Plus Conditioner. KERARGANIC�s advanced treatment and smoothing formulation to repair hair damages and to tame curls, to reduce volume and to control frizz. Engineered with quaternized (positively charged) keratin protein particles, the negatively charged damaged hair fibers attract, absorb and retain nutrients, effectively repairing and nourishing the hair shaft. Other ingredients such as bamboo extract, Amazon a�ai berry oil, cacao extract, Argan oil, proteins, vitamins and amino acids penetrate deeply into the cortex healing the structural outer and inner layers of the shaft. If you have any questions about this product by KERARGANIC, contact us by completing and submitting the form below. If you are looking for a specif part number, please include it with your message. Rafe Lugo Moisture Rich Sulfate Free Hydrating Shampoo, 8.5 fl. oz.